Three launched the MiFi (as in My WiFi) device before Christmas. It is basically a small battery powered device that connects to a 3G network and then turns itself into a mobile wifi access point. 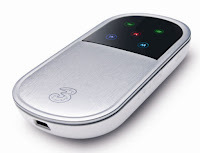 It can also act as a regular 3G dongle if connected using a USB cable to a laptop but the main benefit of the Mifi is that it doesn't need a cable and up to 5 devices can connect to it at once. The Mifi is pretty small and can easily slip into a pocket. It is a bit plasticky but seems solid enough. Three offer the device on contract (where it can be had free) or pay as you go for £50. You can pick it up unlocked for a little more if you don't want to use Three or unlock it (see below). Three even have a deal that gives you a free iPod Touch which of course suddenly becomes a pretty much always connected device when used with a MiFi! For some reason Three have crippled the firmware they ship the unit with, blocking access to the control panel through WiFi (you have to connect using USB) and meaning you need to press three buttons in a particular order to turn it on. They have also disabled all the status lights so you can't tell if it is working or even if it is turned on or off!! Note: If you brick your MiFi or void the warrenty then don't blame me! I had previously used the built in 3G in my Sony TZ laptop and the MiFi works at least as well and seems faster overall. It also generally reconnects if it looses the signal which the laptop didn't. It seems happy with two or three devices attached to it. WIth the new firmware on it really is as simple as press the on switch and it just works providing there is a Three 3G signal of course! It is worth noting that the when used on the Three network the MiFi is 3G only and doesn't fall back onto GPRS when there is no 3G. The battery is quoted as 5 hours and I have had a good three out of it without it running low. If the battery runs down you can plug the device in to the mains with the supplied charger or to USB with the supplied mini USB lead. If you do this then the device is powered from the mains/laptop but this doesn't charge the battery. It is clear from numerous online discussions that this is just due a voltage issue and if you use either a double USB lead from a laptop or a better mains charger (like an Apple iPod charger with a USB cable in place of the dock connector) it will both power and charge the device. One other advantage to the MiFi is that some gadgets that can't usually be connected on the move such as the iPod Touch, Nintendo DSi and PSP can now have mobile internet access. In fact this is a brilliant device for using in a car or when camping. If you do end up buying an iPad you could always get the cheaper wifi version and use this for 3G! In summary the MiFi is good value for money and a really useful alternative to the USB dongle. If offfers more flexibility although it is yet another gadget to charge/carry but at least it helps with battery use on your other gadgets!